A week ago, we were in this space talking about the entertaining unpredictability of the early NHL season and the “to be determined” storylines we start tracking. One of those storylines, so far, continues to play out in intriguing fashion. The Carolina Hurricanes are good. And entertaining. Though the Canes finally suffered their first regulation defeat in their sixth game – a 3-1 loss to the Winnipeg Jets at Bell MTS Place that was anything but a whimper for Rod Brind’Amour’s troops, Carolina pounded the Jets at even strength. The Hurricanes have shown early on that they can flat-out dominate games, forcing teams to spend a ton of time defending. Under the ever-present pretense (until Thanksgiving) that “it’s early” – the Hurricanes look like they’re going to disrupt the Metropolitan Division. They’re 4-1-1, they can score, they can defend like hell, even without a legit No. 1 goalie – especially with Scott Darling sidelined. Could that be what holds them back in the long run? No matter, Raleigh will be an NHL destination in 2018-19. We all knew the Maple Leafs would be a big story coming into the season. They added John Tavares, they haven’t signed William Nylander, most of Canada has them penciled in as a Cup contender. Two weeks in, they are, indeed, the talk of the NHL. The Leafs scored 33 goals in seven games – they’re 6-1-0 – an offensive output that’s far and away the best in the NHL to this point. 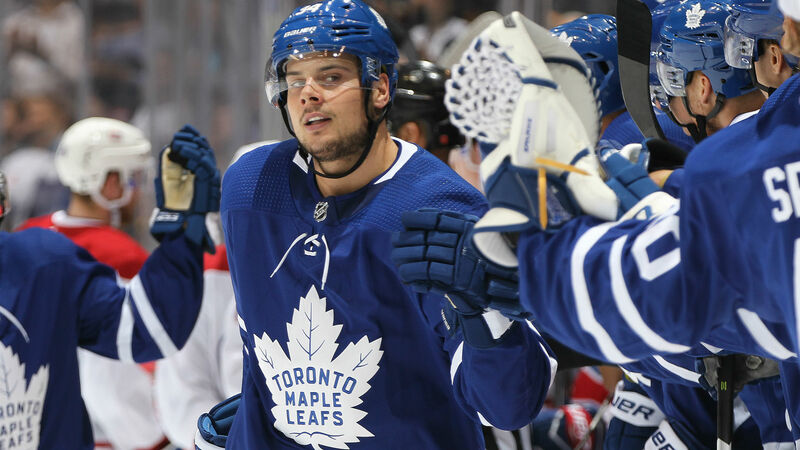 Auston Matthews leads the league with ten goals and 16 points; Tavares has six goals in his first seven games with his new team; and they have a stud on the back end in Morgan Rielly. Meanwhile, their lax defense and so-so goaltending make each game end-to-end must-watch hockey – yet they’ve still won five straight. Oh, and the speculation builds on Nylander, who must sign by Dec. 1 or sit out the entire season. It’s going to be fun watching the Leafs – for many different reasons – this year. Speaking of intriguing stories…the Edmonton Oilers. While we’re not close to panic mode yet, there was conversation about the temperature cranking up around the Oilers during Saturday night’s Hockey Night in Canada broadcast. The Headlines panel discussed the presence of Oilers owner Daryl Katz in New York City for their weekend game against the Rangers, which ended up being their first win of the season. This one doesn’t seem too difficult to break down: if Katz is frustrated by another slow start and seeks answers, he need look no further than the roster his GM has assembled. It’s nowhere near good enough. The Oilers have five goals in three games. Connor McDavid has points on every Edmonton goal, so far – and he’s not getting much help from his teammates. Though Cam Talbot was solid against the Rangers, he looked shaky in goal the first two games. And Peter Chiarelli has failed, so far, to upgrade a mediocre defense corps. It’s extremely early, but the Oilers show many of the same issues that caused them to miss the playoffs last year. Another similar result in 2018-19 will likely be the end of Chiarelli’s tenure in Edmonton – and, for that matter, that of coach Todd McLellan, as well. You figured things wouldn’t go as swimmingly for the Golden Knights this year. And that’s been proven over the first two weeks. They’ve stumbled out of the gate, winning two of their first six games. It’s not an insurmountable hole, but without the play of Marc-Andre Fleury (who has been ridiculously good), they’d be even further back in the Pacific Division. The Golden Knights are already five points back of the division-leading Anaheim Ducks, and perhaps most troubling for the Golden Knights is they’ve scored only 11 goals in six games. They’ve given up 19. Now, top center Paul Stastny will miss at least two months with a lower body injury, which is a huge blow to a team that’s not getting offense from its usual suspects yet. We’ll see if they can ride Fleury to a climb up the standings, because they’re already behind the 8-ball. The NHL’s only remaining teams without a win are: the Florida Panthers and the Detroit Red Wings. It’s easy to see which team is better suited to snap out of it, however, even before comparing rosters. The Panthers have played only three games and lost all three times by one goal. The Red Wings are 0-4-2 and own a terrible -16 goal differential.